Tekoma is set on one the loveliest beaches in Rodrigues, and from its hillside setting you can take in the fine ocean views from dawn to dusk. The atmosphere is calm and unhurried, reflecting the pace of island life, and friendly staff help you feel at home. With just 15 rooms this is an exclusive property. All rooms are spacious and self-contained with a sitting area, dressing room, shower room and enclosed outdoor bath. Rooms benefit from air conditioning and come with TV, phone, Wi-Fi and minibar as standard. Each has a shaded terrace with a table and chairs, and views of either the lagoon or lush gardens. The restaurant offers traditional local dishes plus international fare, all created using locally-sourced ingredients. The dining room opens onto a terrace in the pretty garden allowing you to enjoy meals al fresco. Menus change each day. There is a beach bar where you unwind over a chilled fruit juice or something stronger as you chat to other guests. The beach bar is open throughout the day amd serves snacks as well as drinks. The hotel has an inviting swimming pool, and has easy access to the beach where there are loungers exclusively for guest use. The sandy beach is ideal for strolls, and there are several marked trails you can follow, with staff only too happy to share their favourites. The sheltered beach and nature reserve of Trou d'Argent can be reached on foot, with many other destinations a short drive away. Watersports are available nearby and the hotel has its own diving centre. The spa is the ideal place to relax, wether you've had a busy or restful day, with some expert pampering and 'me' time. Open: Tekoma is open all year. Location: The hotel is in Anse Ally on the east coast of Rodrigues. The hotel is 18kms, about a 30 minute drive, from Plaine Corail airport, and 12kms from Port Mathurin, the capital of Rodrigues. 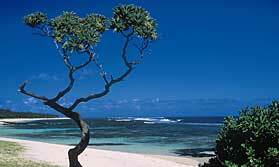 There are regular flights between Mauritius and Rodrigues and the flying time is around 90 minutes. Rooms: There are 15 guest rooms, all with 65sqm of space, and private terraces with comfy chairs and a coffee table facing either the lagoon (9 rooms) or garden (6 rooms). Each sleeps up to 2 adults and 1 baby or infant. There are 2 interconnecting rooms. All have a sitting area, dressing room and an en-suite shower room with twin hand basins, shower cubicle and toilet plus an oval bathtub in an enclosed patio open to the sky. Amenities include air conditioning, satellite TV, IDD phone, internet access, safe and minibar. Bathrooms have a hairdryer and razor point. Activities: You can spend lazy days at the hotel and on the beach. Staff offer advice on walking and driving routes. Port Mathurin is 20 minutes away by car and has a range of shops and a market. Staff can help arrange watersports such as kitesurfing and snorkelling. The hotel has a scuba diving centre with activities for beginners and experienced divers. Facilities: There is a restaurant and Kreek Beach Club where you can get drinks and snacks during the day (10:30am to 6pm). There is a lounge. The hotel’s spa is open every day from 9am till 7pm, and offers personalised treatments using products of Seven Colours, a reputed Mauritian brand. There is also a hammam. The garden is a pleasant place to sit and relax. There is a swimming pool of about 45sqm. Guests have access the beach where there are sun loungers. Pool and beach towels are provided. Dining: Tek Restaurant is open from 7:30am till 10pm daily. It specialises in Rodriguan Creole dishes as well as international cuisine, and has indoor and outdoor dining areas. Special themed evenings are sometimes arranged. Private meals can be organised. Children: Children of all ages are welcome. The restaurant offers a children’s menu. Babysitting can be organised.